Gaining muscle without using performance-enhancing substances takes a significant amount of time and effort, even with the most effective mass-gaining training program in place. How much muscle an individual gains per month depends not only on workout and diet plans but also, on gender and genetic predisposition for muscle gain. While you may see noticeable results after your first month of training, for most people, substantial results will take months or even years. When you begin bodybuilding for the first time, you are likely to experience relatively substantial gains during your first few months of training. Gains usually slow down as your body adapts to lifting. As noted by Brad Schoenfeld, an NSCA Personal Trainer, a beginner bodybuilder can pack on more than 15 pounds of muscle in six months, or about 2.5 pounds per month. Women bodybuilders typically expect to gain about half the amount of their male counterparts, according to Lyle McDonald on his Body Recomposition website. For seasoned lifters and athletes who've trained strength significantly as a part of their training plan, muscle gain expectations diminish and tend to correlate with time spent training. Men training appropriately for muscle gain can expect to put on about 1 pound per month, while those with 3 years of dedicated training will likely only be able to add about half a pound per month. After 3 years, gains can potentially plateau. You may be able to push through plateaus and make more muscle gains by changing your training plan and diet. Genetics inevitably play a role in the rate at which you gain muscle and the amount that you will ultimately gain. A 2005 study reported in the journal "Medicine and Science in Sports and Exercise" illustrates this point. Male and female participants used the same weight-training program for a 12-week period. 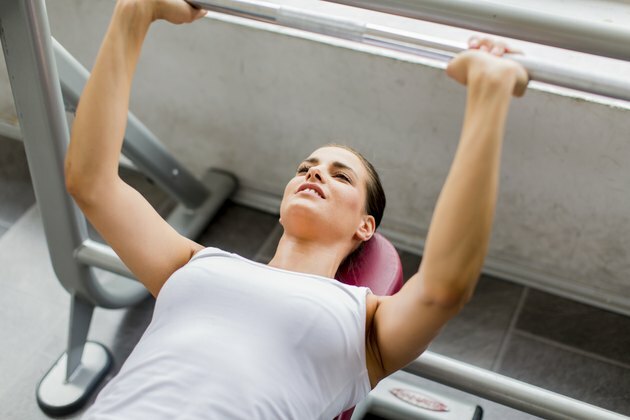 Changes in biceps muscle size after training ranged from a minor decrease in size to an addition of 13.6 centimeters. Men gained slightly more muscle size than women. Are You Gaining Fat, Not Muscle? If you are gaining weight at a faster pace than 4 pounds a month, you are most likely either retaining water or gaining fat, or both. As suggested by Ray Klerck in "Body Trainer for Men," checking your body fat every couple months can help you avoid this pitfall. If you've put on weight but your body fat has remained the same or decreased, you are most likely gaining muscle, not fat. Some fat gain tends to be inevitable as you pack on the muscle, but if your fat gain becomes excessive, work to revamp your bulking diet. Body Recomposition: What's My Genetic Muscular Potential?